Have you wanted to listen to your favourite music in your car or on your iPod? Afraid that you would have to purchase new music and abandon your collection? Introducing Media Digitalizer, a innovative cassette to CD recording software. 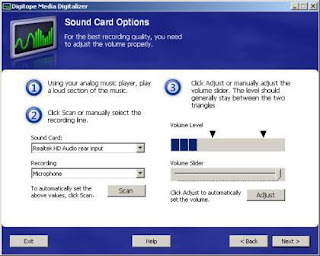 Using your computer, Media Digitalizer will allow you to record cassettes, records or live audio from a microphone and other analogue audio sources and save them in CD, MP3, WMA or Wave format. The CDs and MP3s you create with Media Digitalizer can then be used with any player that supports these files. Additionally, you can use Media Digitalizer to backup your cassettes into long lasting digital formats for archival and storage. Media Digitalizer makes the recording process simple and easy. The following is a overview of recording cassettes into CD. Recording other media, such as records, or saving the audio in a different format, such as MP3, is very similar. Even if you have never recorded anything with your computer, you’ll find Media Digitalizer simple and easy to use. The first step is to connect your tape player to your computer. This is very easy. You'll need a inexpensive audio cable to connect the tape player to the computer. You'll find this in any electronics store. Connect the cable from the headphone socket on the tape player to your computer's microphone or line-in socket. You're ready to begin recording! Looks like a convenient way to record your cassette's to CD and MP3 & listen to them on your iPod/computer. Wish it was freeware though. Well, you can do this using any software that allows you to record from Line In. Instead of connecting the walkman/tape player to the headphones jack, connect it to the Line In, start your software & then select Line In as the source for recording and you're done. Back in the days I think I used Musicmatch for doing this. Who can tell me what is wrong with these two sentences? Have you wanted to listen to your favourite music in your car or on your iPod? iPod is brand not the name of the electronic device. Like a Cresent wrench. Cresent made an adjustable wrench but the world calls an adjustable wrench a Cresent wrench. Tell us My comment was made just casually and off-the-cuff, btw. The Magix company ( Music software, video software, and software for photo and graphic creation and editing by MAGIX ) has a lot of high quality software along those lines - both audio and video. But they are not free. I own a couple and have to say that these people know what they are doing. ahh too late. when the cd revolution took over the cassette market, i got rid of all mine. but good info thx.